No fencing project is too great or too small for the professionals at Chesley Fence & Deck. We can do it all, and we have for decades. Since 1967, we have been faithfully serving the Germantown, Illinois community, offering only excellent outdoor living solutions to all our customers. Plus, we are a clear favorite among homeowners in the area, as we have installed more fencing than any other fence company in the territory. Why Choose Chesley Fence & Deck? Additionally, our fencing options are nothing to balk at. We offer three industry-leading fences, all crafted to provide beauty, security, and privacy for your yard. 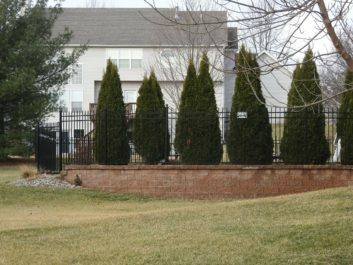 Our vinyl fencing is low-maintenance and durable and will not fade or become discolored overtime, while our aluminum fencing has no visual rivets or screws for a seamless finish and can be installed with two inches between pickets rather than the traditional four to keep pets and children safe in the yard. And, for wood fence enthusiasts, we offer Western Red Cedar fencing that will resist wrapping and cracking and is installed with true 2 x 4 rails to achieve increased durability. To learn more about why we are the fence company of choice in the area, contact Chesley Fence & Deck today. We proudly serve homeowners throughout Germantown, IL and all of Clinton County, including Beckemeyer and Carlyle.